This number — The Basic Unit of Upside, or BUU — offers simple insight into the effect of website optimization on your business. My new Marketing land article answers some burning questions for your business. If these questions aren’t burning in your mind, then why not? 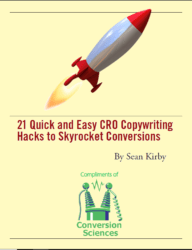 Click for a Conversion Rate Upside Report that does the math for you. https://conversionsciences.com/wp-content/uploads/2018/11/conversion-sciences-conversion-optimization-agency.png 0 0 Brian Massey https://conversionsciences.com/wp-content/uploads/2018/11/conversion-sciences-conversion-optimization-agency.png Brian Massey2014-04-08 09:39:302018-12-16 19:18:19What is Your Basic Unit of Upside?